There are few experiences as exciting and rewarding as buying a brand new car. Remember how fast your heart beat as the salesman dropped the keys in the palm of your hand? 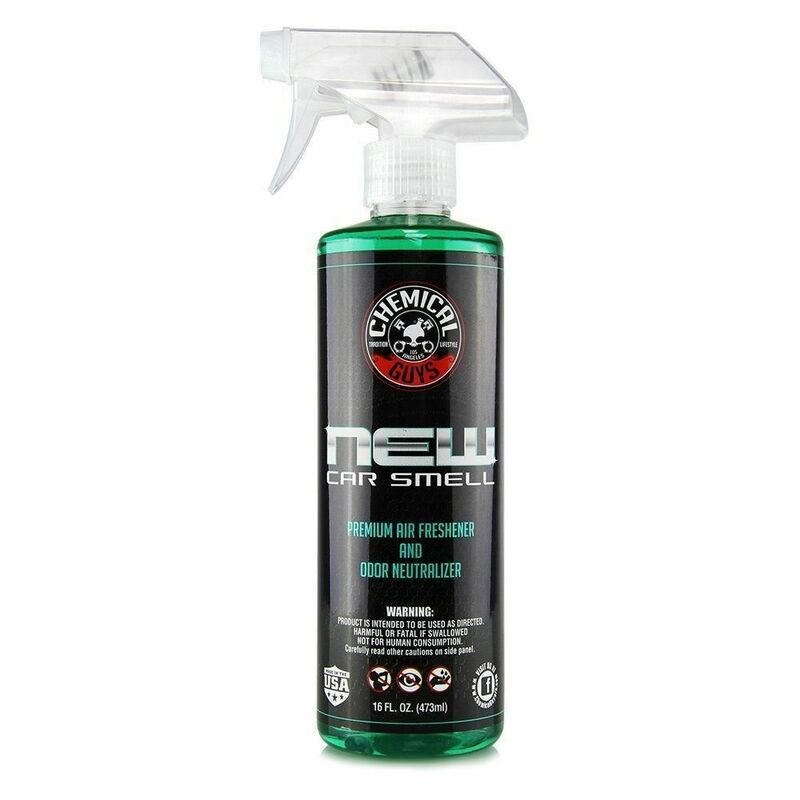 Now you can recreate that sensation and excitement with Chemical Guys New Car Smell Air Freshener & Odor Eliminator. That "new car" smell is so unique because only new cars smell that way! It always feels great to slip into a brand new car and breathe in the scent of freshly-tanned leather, the musk of clean carpets, and the pure essence of clean plastic and rubber car parts. Now you can sustain that same scent and feeling for as long as you own your car with New Car Smell Air Freshener. Mist a couple sprays of New Car Smell inside the cabin after a vacuum job, and you'll swear you just bought the car yesterday. And although we may leave behind sweat, food crumbs, and pet accidents inside our cars, the odor-eliminating properties of New Car Smell destroys the lingering odors to restore a fresh scent. Active enzymes seek out and erase odor-causing maladies so the inside of your car can smell fresh and fantastic even after any new car scent fades with time. Every car can smell like a brand new car with the right touch and the right product. Take years off your car's interior and recreate the magic of a brand new car with Chemical Guys New Car Smell Air Freshener & Odor Eliminator. Lightly mist New Car Smell around carpets, cloth upholstery, and under seats. underneath the recirculation intake under the dashboard on the passenger side.